Salsa Macha is a very thick and unusual salsa that comes from the state of Veracruz. Located along the coast of the Gulf of Mexico, it has been for centuries, a gateway for waves of immigrants from all over the world into Mexico (like my paternal grandparents). Veracruz, being such an important channel for exchange and always immersed in flux, has seen some of the most interesting combinations of ingredients, cooking techniques and traditions. Salsa Macha is an example. It is made by frying dried chipotle chiles (mainly the morita kind) in a generous amount of olive oil, along with garlic cloves. The last two ingredients courtesy of the Spanish conquest, for sure. Then it is seasoned with salt. Some versions add fresh chiles such as serranos or jalapeños into the mix. Many times peanuts are added and sesame seeds too. This one here, is my preferred version, and I take the liberty of adding a joyous amount of vinegar and some brown sugar or piloncillo to balance it off. This combination pleases me so much, that I spoon it on crusty bread with much joy. Since it has a lot of olive oil, the chile paste will sink to the bottom after it rests for a few minutes. You can choose to stir it up and eat it well combined, or you can let it settle, and use the flavored oil. p.s. The name is a funny one, because macha, is the femenine of the word macho. So it can translate as being a masculine female salsa. Macha can also translate as brave, so you can take your pick! Set a large heavy skillet over medium heat and add the oil. Once the oil is hot, but not smoking, add the garlic cloves. Stir and fry for about one minute, until they start to gain color. Add the chipotle chiles and peanuts, stir and fry for about two minutes. Add the sesame seeds, stir and continue to fry for about a minute. Remove from heat. Carefully transfer all the contents from the skillet into the jar of a blender. Let cool for about 10 minutes. Add the salt, sugar and vinegar. Process until smooth, starting with low speed and building up to high speed. 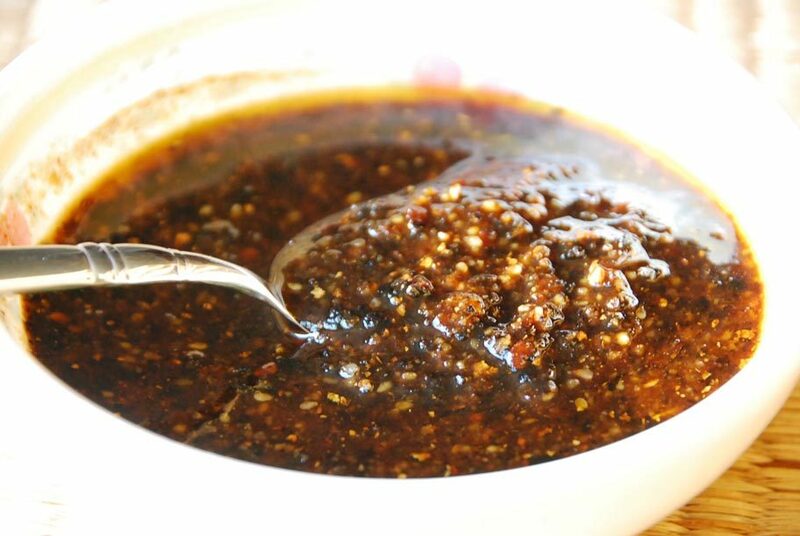 Pour into a container, let cool and refrigerate if the salsa will not be used that day. I lived in San Diego 35 years and I am a Salsa freak. I never ran into this before..it is AMAZING..! sent some to my step-daughter and her boyfriend, and he loved it, and I sent them your recipe. I made minor adjustment..less brown sugar, 1/2 cup less oil, mostly chili Arbol’s with 3 or so Chili Morita’s ( it’s what I had at the time ) and sunflower seed’s vs peanuts. Still it’s a fantastic Salsa, thanks for sharing it ! Yay! Thanks for giving it a try and making it your own, Rob. Just made it. Love, love, love <3 I will definitely try with fish a dish! Thanks. 3 loves….love it, Grrl Jeanius! Omg ! I just made your Salsa Macha and it was a huge hit! We had it on our fish tacos (your recipe too). Hubby and I love you and your show! Thanks Pati!! So happy they were a hit, Nina! The recipe used on Season 7 episode “Ensenada’s Epic Seafood” was different in several respects from this one. I don’t have access to that episode anymore, so could you please list ingredients from the latest version? I know it had morita chilies and another variety. Thanks! You can use morita chiles if you like, Bob…I usually use a mix of morita and mecca chipotle chiles. I hope you enjoy the salsa. Thanks for sharing. Had something called Potatoes Machas at a restraint and this sauce looks very similar. Excited to try! Just made this today and am SO glad I did!!! If you are a whimp like me when it comes to anything spicy just cut the peppers open with kitchen shears and scrape the seeds out. It’s still a bit spicy but more manageable, atleast for my tender taste buds! Love love LOVE your show and look forward to making more of your recipes!!! I just tried this at my local restaurant & I had no idea what it was until the server informed me. I loved it so much & searched for a recipe, and I came upon yours. I can’t wait to make this tomorrow, as yours look just as tasty if not more! Thanks so much for sharing this delicious recipe! I am soooo in love with you and your show and your cooking and just everything! You have given me this renewed love for mexican/south of the border cuisine! I secretly want to be in your pocket when you go traveling to markets and restarants! I cannot wait to try this recipe and many more. I am so glad I was watching the marathon on KERA/PBS. Thank you for being the joy that you are to watch…..don’t ever change! Oh wow! Thank you so much for your comment Robin! I enjoy your show and the travel/food aspects of your show. My question is where is a source that explains the flavor concepts or notes of the various chilis, both fresh and dried. I’d really like to know what each chili tastes like and how hot each is on a scale if 1-10 for example or in comparison to a jalapeño. Thank you Pati! Does anyone know if this recipe can be preserved through either a pressure canner or hot water bath? I’m not sure but it lasts a long time in the fridge…. This freezes quite well and stores without issue. This is off. It’s good, but not delicious. First, it is way too much oil. Second, the peanuts aren’t right. I’m thinking maybe pepitas. A good start, but I’ll continue to experiment. So sorry to hear you didn’t enjoy it Peejay. Made your Salsa Macha tonight and we loved it. We used it simply as a dipping sauce with bread. Thank you for sharing. Veracruz is a hidden culinary spot! Yum! I love Veracruz, and I’m so happy you do too. Patti, I just learned about Salsa Macha in 2016 thanks to a friend’s gift of some Ki Gourmet’s bottled version. LOVE IT! But since it’s not available in states, glad to find your recipe. My question: Recognizing your recipe makes 3 cups and looking at the ingredients, I wonder, does the remainder really have to be refrigerated? I attended and thoroughly enjoyed your dinner in Laredo back in October. I’ve made several of your salsas and taco recipes, and my family loves every bit of it. I just finished making this one, Salsa Macha, and I was wondering if you might suggest what to serve it with, or cook with it. It doesn’t seem to be something we would just eat with chips. Do you use it to cook meats, or verges, or just as a sauce to dip into. Love the aroma, and unique taste of it. I want to make sure to put it to good use, in as many ways as possible. Hola Lilli! The possibilities are endless! You can choose to stir it up and serve the salsa as a paste, you can let the tasty solids settle… or you can use a bit of the flavored oil for multiple purposes such as drizzling on fish or shrimp, cooked potatoes, pizza, toast, cooked vegetables, or even an omelet! I new to this salsa, do you serve on top of food, or can you have it as a dip. sounds delicious. This is a delicious salsa! I decided it would taste good with a pan-fried Tilapia filet topped with the Salsa Macha. What do you think, Pati? All I can say is that it blew my taste buds away with so many delightful flavors and some heat! Definitely a keeper!! I also will try this Salsa Macha with a pork loin or a turkey breast, both stuffed and rolled up. I can already tell they would taste fabulous! Have you ever added napoles to this recipe? or to any salsa recipe? You can add ANY salsa to no pales! How do stem the dry Chile’s? Just snap the stem off, super easy. Hi, Pati. You are a beautiful cook inside and out, putting fun in the kitchen like it should be. I like watching your show and learning new things to cook for my family as well as all the interesting things about Mexico. In this salsa recipe, would it be totally different to use fresh chilis from the garden or do you need to dry them first? I have recently discovered how easy and wonderful to make an orange-red chili sauce (like a sriracha) and I thought I would try this salsa. Oh, ok. I see what you mean with the smoky flavor. I look forward to trying salsa verde and habanero salsa (taking the advice on removing seeds, ha). Love all the cilantro you cook with. It’s an addictive flavor and healthy. Hola Eric, I like it on fish tacos, made with a white fish like cod, haddock, or tilapia. Wow! I mean wow! I just made your salsa macha recipe for my staff. It is absolutely delicous. We fried fresh chips, and also made guacamole. We piled the guacamole and topped it off with a mound of salsa on our plates. Everyone is loving it! Thank you Pati for the great recipes. Haven’t found one yet that wasn’t a hit! Hola Regina, Thank you for making it! I’m sooo happy everyone enjoyed!! ouse this summer and the crowd loved it !!! Making a batch tonight. Also, how long can you store it? For a VERY LONG TIME… Months, really. Keep it in the fridge. Superb..used a combo of Guajillo’s and 5 or 6 whole arbol’s and was just perfect heat..about a gringo “5”. Also substituted a bit of lime juice for the some of the vinegar and it added a fresh touch. Tomas, So happy you tried this salsa! Hola Pati me encanta tu show! tengo una pregunta si no encuentro dry chipotle puedo usar de lata? Hola! La salsa macha en verdad se hace con chiles secos, no en adobo. Si no encuentras Chipotles secos, busca Chile de árbol o Chile ancho… Te va a encantar. Saludos! Ola patii…me guzta mucho tu programa me guzto tu zalsa veracruzana la voi a preparar thank u kisses..
display it in my kitchen. Hi Roxana, I hope your guests enjoy it, too! Thank you for trying the recipe and THANK YOU for getting my cookbook!! Hola Pati hace unos dias que veo tu programa y me parece estupendo… Gracias por tus recetas. Me da mucho gusto que te guste, Guillermo, gracias por verlo. When you say to use 1 1/2 to 2 cups of dried chipotle chiles, how do you measure them? Do you tear them up to make 2 cups? Could you use Ancho chilis? Hola Barb, Thanks for you message! If you are measuring the dried chipotle chiles in cups then, yes, I would tear them up and then measure. 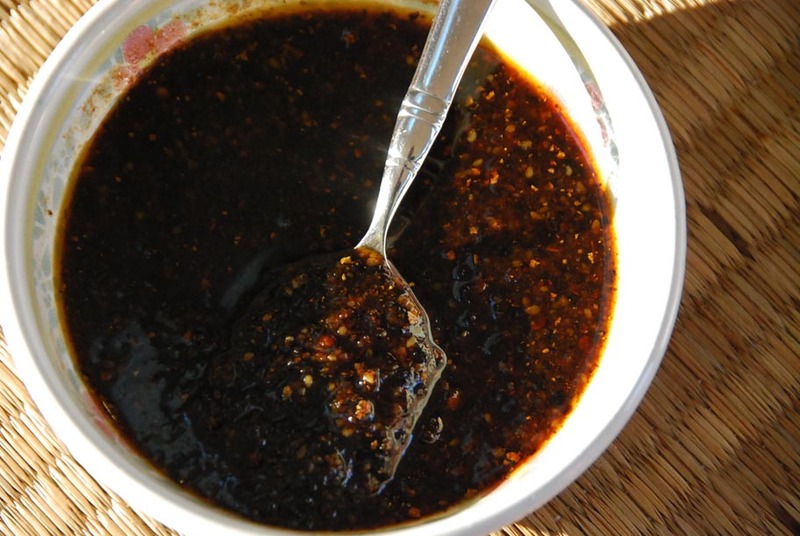 You may try it with ancho chiles, but you will get a very different flavor with the anchos. Pati, your great and so is your show. I was disgusted at some of the comments. People will always have something negative to say and 90percent don’t have the courage, talent or knowledge to do what you do.so kudos to you!!!! I love your speech, your show and your food! You are one of my favorite PBS shows to watch and much more genuine than anything on Food Network! Thank you for offering these experiences! Thank you so very much for your kind words. They mean a lot! Pati, your recipes take me back to my mom’s home cooking, and I am enjoying the visit. Thank you so much for the pride you show in our Mexican heritage and in our most flavorful dishes. Love your show!! I love your show so much. You make Mexican cooking sound so simple and fun. Your recipes are fantastic. The first time I watched your show, I had difficulty understanding your accent, but I got used to it quickly. Mike needs to have more patience, or is he just a hostile, intolerant person? Anyway, I like you, your show, and your wonderful recipes. Thank you so much for your kind message, and thank you so much for having the patience to get used to my accent! Thanks so much for taking the time to write and I hope you enjoy all my episodes: more new coming your way! Dear pati’s Mexican table I began to watch you’re show recently on create tv . But as a home cook myself I felt that each of the recipes that were being presented were simple and that anyone can put it together. I was hoping to see more changeling recipes something that would wow all the viewers who enjoyed watching this show .I understand that every chef has their own style. I would like to challenge you to take Mexican cuisine to a whole different level surprise us with something different. Thank you for the challenge Rebeca: I am up for it, wait for Season 4! Mexican coooking is nice, simple, yet elegant and delicious. How hot is this salsa on a scale from 1-10? Are you Mexican? How do you know the nuances of Mexican culture for this word? Pati is a well-educated bi-lingual cultural and political analyst. Are you going by a literal translation? And why peanut oil? Peanut oil is so unhealthy especially when you heat to smoke point. The Omega-6 oils oxidize so easily and become unhealthy and plus it’s probably GMO. High quality EVOO and/or coconut oil instead would be the more healthy fat option. Her recipe is amazing and tried and tested. Why not try it as she wrote it! ??? Yes I am Mexican, and I have spoken Spanish all of my life. If you would not be so quick to judge comments posted on this blog you would take time to read. I was not offering a way to change Pati’s recipe I was mentioning an “Asian” version of this sauce which I make.. This after all is a discussion, isn’t it? And as for using EVOO, the smoking point of it is way too low. EVOO is ideally used for dressings and such. Pati’s recipe calls for regular olive oil which has a higher smoking point.. Next time read and be informed before you post! Coconut oil has a low smoke point similar to EVOO. Will G is correct–‘regular’ olive oil or peanut oil are better choices as their smoke points are a full 100 degrees higher. Holy taste explosion of flavor Pati! I got so inspired by your show that I ran out and got the cookbook this Christmas. As apart of my resolutions to do more healthy but satisfying cooking for my family in 2014 I am finding great ideas in your blog and book! Living in Austin, Tx we have many of the ingredients for your style of recipes. I made the salsa Macha with chiles de aboles and fresh roasted peanuts (shelled by my 3 yr old). I have never made latkes before! Wow I just love you used sweet potatoes in these. Thanks to the creama we could handle the heat of the salsa. Wow such a party in the mouth! Yey Cara, so happy to hear!! I also get the help from my littlest boy to shell the peanuts, though he eats half as he goes along… Thank you for buying the cookbook: I hope you enjoy cooking from it as much as I enjoyed writing it! This is one of the best things I’ve made or eaten all year. Can’t wait to share it with everybody. ¡Gracias, Pati! Here in the Los Angeles area, folks that refer to chipotle chilies understand generally they are smoked jalapenos. Your recipe suggests they are a different pepper. I have never seen chipotle except the canned variety, even in several latino markets just a few blocks from where I live. Could they be known also under a different name? Exactly Gary, they are dried and smoked jalapeños. There are two kinds of the dried chipotles: mecos and moritas. Either can be turned into a Chipotle in adobo. What about replacing the Chipotle chiles with Chiles de Arbol? Yes you can! In fact some people use Chiles de Arbol, but beware of the heat…. This looks so rich and inviting. I bet it packs a nice little punch that will wake up the taste buds and have them begging for more! You will LOVE it Kim! Great to see you yesterday in Winchester!